In honor of the neighborhood's abandoned bicycles we're sharing this tidbit. If you're a biker and would like a place to park your bike in the hood, request one! 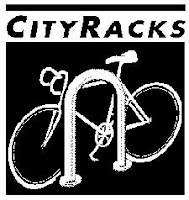 If you know of a spot outside a business you can request a rack then click here to access the form on the CityRacks. Keep in mind the rack will be installed on city-owned property on concrete sidewalks that are a minimum of 12 feet wide. They have to be out of the flow of pedestrians and at least six feet from other "street furniture" like signs, mailboxes, etc. and have to be 13 feet from fire hydrants and 15 feet from bus shelters. We think a rack in front of the lunchenotte or Foodtown on McDonald and Albemarle would be a great location! We'd also love to see some near Greenwood and Albemarle Playgrounds.